Pro-Line Helios RC Body Looks Awfully Familiar (Someone Might Be Seeing Master Chief In Court) | OhGizmo! By Andrew Liszewski on 02/19/08 • Leave a comment! 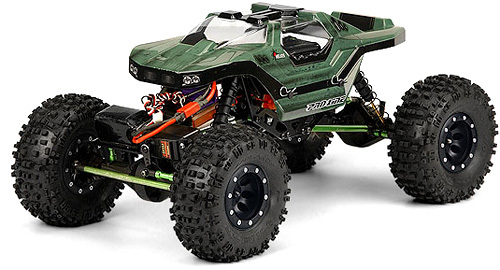 This Rock Crawler body from Pro-Line is specifically designed for RC cars that take off-road to the next level. The Helios body as it’s called is one of three bodies that specifically conform to the minimum dimension rules set forth by the USRCCA (United States Radio Controlled Crawler Association) for the 2.2 inch Crawler class. Besides bearing a striking resemblance to Master Chief’s trusty Warthog, the Helios body weighs just 41 grams (in its unpainted state) and is made from genuine GE .030 shatter proof lexan. At just 5 inches wide the body is less likely to get hung up on large rocks, and its low profile makes it easier to clear overhead obstacles.